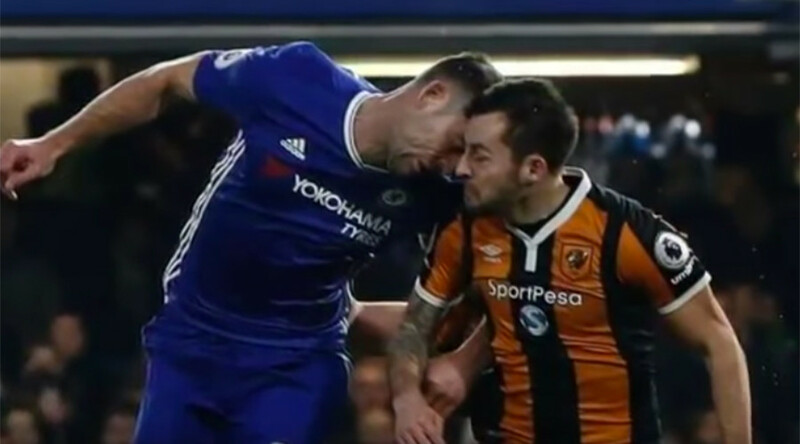 Footballer Ryan Mason fractured his skull in a sickening collision during Hull City’s English Premier League fixture against Chelsea at Stamford Bridge on Sunday. The horrific injury occurred when Mason contested an aerial challenge with Chelsea defender Gary Cahill following a cross played into the Hull box. Mason got to the ball first and headed clear, but then an incoming Cahill’s head collided full force with Mason’s right temple, causing both to fall to the ground heavily. Distressed teammates of both signaled frantically for medical staff to enter the field of play and give treatment to the stricken players. After receiving lengthy treatment, Mason was stretchered off the pitch and taken to a local hospital, where his condition has been described as stable. “The Club can confirm that Ryan Mason sustained a skull fracture in our fixture at Chelsea this afternoon,” a Hull City club statement read. “He was taken to St Mary’s Hospital where he has undergone surgery. Ryan is in a stable condition and is expected to remain in hospital for the next few days. 🔶◾ | Superb show of love from the #FootballFamily last night! “A further update will be issued tomorrow,” it added. Cahill also received treatment but managed to make it to his feet unaided, apparently having suffered no serious damage. Thoughts are with Ryan Mason this morning. Get well soon. The Chelsea defender went on to score his side’s second goal, a header, in the 2-0 win over the Tigers. Mason became Hull’s club record signing when he joined from Tottenham Hotspur in 2016. The 25-year-old has received one international cap for England to date. Antonio Conte told reporters after the match that everyone at Chelsea were sending their best wishes to Mason. "First of all, everyone at Chelsea wants to wish [Mason] the best," Conte said. "It was a bad accident with Gary. After the first half, it wasn't really good with Gary, but we decided to continue with him. It isn't the first time Chelsea have been involved in an incident involving a player suffering a fractured skull. During a match at Reading FC in October 2006, first-choice keeper Petr Cech fractured his skull in a freak challenge in the first minute of the game. Reserve keeper Carlo Cudicini then suffered the same injury in stoppage time, forcing defender John Terry to see out the rest of the game in goal. Cech still wears a protective helmet as a result of the incident.